It is difficult for humans to grasp just how far migratory birds travel each year. 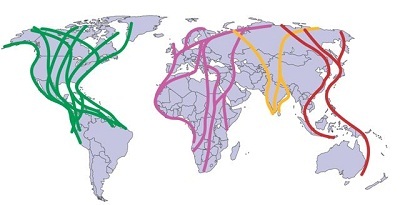 As shown by the global flyways map (right) migratory birds can travel incredible distances across continents, oceans and even hemispheres during their migrations along routes, also known as flyways. 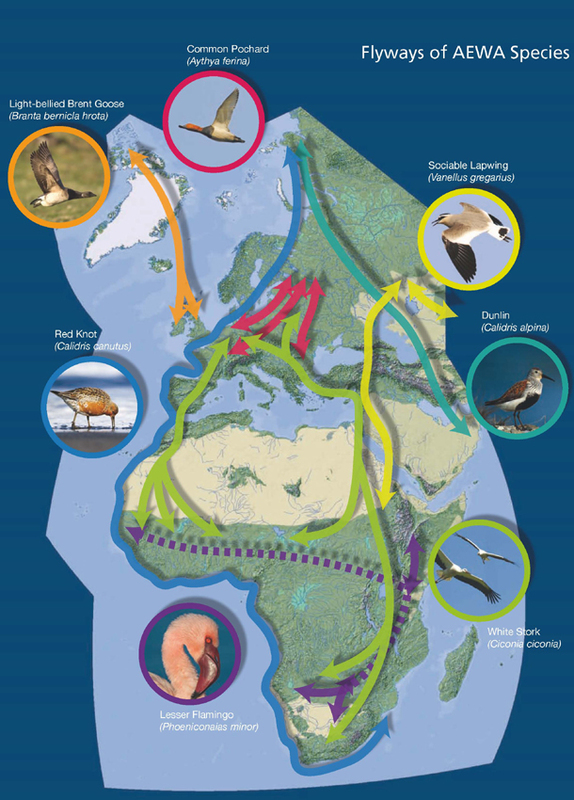 As they travel along these vast flyways, migratory birds are heedless of the many political borders that they cross that are shared by all countries along migratory bird flyways. Migratory birds use networks of sites that act like 'stepping stones' along flyways and are important for resting, feeding, breeding and wintering. Many sites that birds depend on are under threat from direct human activities such as land reclamation and deforestation, as well as indirect human influences, such as climate change, damage these sites through habitat fragmentation and degradation. Large numbers of important sites have already been damaged, or lost entirely. The dangers migratory birds face in different countries along migration routes vary immensely depending on political, economic and environmental situations, yet birds have no choice but to face the many dangers caused by humans as they fly from country to country. Further, the loss of just one of these important bird sites can endanger migratory birds that are shared by all countries along the flyway. That is why it is so important for governments, conservation organizations, scientists, and ordinary people around the world to work together to conserve migratory birds. Often when migratory birds arrive at important sites during their migrations, they are hungry and exhausted. They need to rest and feed before migrating further. That is why when the birds arrive to find the sites damaged or even completely destroyed, it can mean less food, less rest and even death. An example of an important migratory bird site that was greatly damaged by human activity is the Saemangeum Estuary in Yellow Sea region in the Republic of Korea. As part of a land reclamation project of enormous proportions, estuaries, tidal flats and sea shallows have been drained, filled and converted to land to be used for human activities. The birds that relied on Saemanguem were shared between all the countries along the flyway. Yet the loss of one site in one country resulted in a devastating impact for birds shared by many countries. The land reclamation of the Saemangeum illustrates well the importance of networks of sites that birds use along migration routes and why governments, conservation organizations, scientists, and ordinary people around the world must work together. The Agreement on the Conservation of African-Eurasian Migratory Waterbirds (UNEP/AEWA) is an intergovernmental treaty dedicated to the protection of migratory waterbirds and their habitats. Through UNEP/AEWA, governments work together along with non-governmental organizations and scientists, to conserve the migratory birds they share. UNEP/AEWA covers 255 species of birds that are ecologically dependent on wetlands for at least part of their life cycle, including divers, pelicans, cormorants and flamingos. AEWA stretches across 119 Range States, from the northern reaches of Canada and Greenland, across Europe, the Middle East and Central Asia to the southern tip of Africa. Many of these countries have become Contracting Parties - at this stage 71 countries and the European Union are Contracting Parties to AEWA. AEWA brings these countries together, coordinates activities and projects, holds meetings and provides the platform for international cooperation. The measures that are to be taken up by the Contracting Parties are specified in Action Plans, which are legally binding. The plans detail key issues, such as species and habitat conservation, management of human activities, research and monitoring, education and information as well as legal and emergency measures. UNEP/AEWA was developed under the framework of the Convention on the Conservation of Migratory Species (UNEP/CMS). The Convention on the Conservation of Migratory Species of Wild Animals (also known as CMS or Bonn Convention) aims to conserve terrestrial, aquatic and avian migratory species throughout their range. It is an intergovernmental treaty, concluded under the aegis of the United Nations Environment Programme, concerned with the conservation of wildlife and habitats on a global scale. BirdLife International is a partnership of 116 independent national non-governmental organizations (NGOs). They strive to conserve birds, their habitats and global biodiversity. 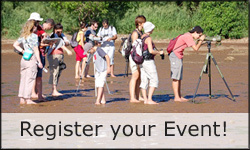 BirdLife International and their partners operate in over one hundred countries and territories worldwide. Their aim is to prevent the extinction of any bird species, to maintain and possibly improve the conservation status of all bird species and to protect sites and habitats important to birds. BirdLife International acts as a global networking partner and brings organizations and people together to share and exchange skills and experiences to achieve an overall goal – the conservation of birds and their habitats. Since migratory birds cross many international borders on their journey, it is crucial to have standardized conservation policies and to act as one international team. BirdLife International works with a growing network of people and organizations to advocate policy change. They also believe that it is important to engage local people in their work to achieve more effective and sustainable conservation. Therefore, they work alongside local communities, adapt conservation measures to local circumstances and help to integrate conservation with social development and human wellbeing – for the benefit of people and biodiversity. BirdLife International is a very important partner to UNEP/AEWA and the World Migratory Bird Day Campaign. Above are the logos of the main World Migratory Bird Day Partners. These are just a few of the many amazing networks comprised of governments, conservation organizations and dedicated people that work together in support of international migratory bird conservation. World Migratory Bird Day is a joint campaign of these main partners aiming to inspire, promote and help support migratory bird conservation efforts worldwide.